Get the training and education you need to serve the fastest growing fitness population in the US. This senior fitness certification course includes 9 hours of ONLINE lecture, 9 hours of ONLINE practical training preparation and test vouchers ($250 value) to test at any of our college approved sites. 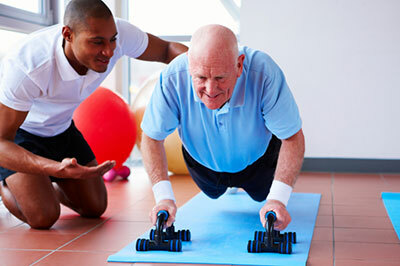 Passing both exams will award you a Level 1 Older Adult Fitness Specialist Certification. This unique specialist certification provides you with the specific knowledge and practical skills you’ll need for working with older adult clientele. Learn what common ailments and physical conditions are germane to this special population and how to design age appropriate, fun and functional exercise programs. * Order your textbook 888-330-9487 or click on the link below to purchase online. Get the entire online review program for the Older Adult Fitness Specialist course all in one place. Veteran subject matter experts / instructors will mentor you through all of your learning needs as your pursue the core knowledge and practical skill overview. Take the entire program AT YOUR OWN PACE in the convenience of home or work. Includes quizzes to assure your knowledge is sound to help clients safely. Includes discussion boards to share with your mentor’s input. Engage your fellow community of students worldwide. Includes study tools with beating hearts video links and more!